Lunda Vincente, a Congolese refugee in a camp in Zimbabwe has been corresponding with Louise Meyer of SHE for several years. 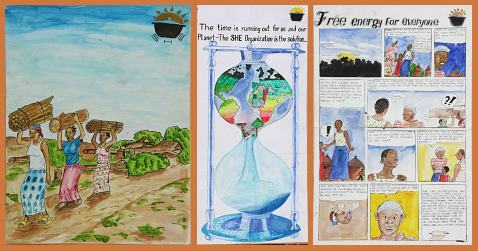 He continues to share with us his beautiful artwork, much of which tells the story of solar cooking. Solar Household Energy has arranged for several shows of his art in the Washington DC area. Wanting others to see his work as well, we have created a blog to display it. Keep checking back, as he is constantly adding new works.